2003-10-01 Assigned to CROSSLINK POLYMER RESEARCH reassignment CROSSLINK POLYMER RESEARCH ASSIGNMENT OF ASSIGNORS INTEREST (SEE DOCUMENT FOR DETAILS). Assignors: KINLEN, PATRICK J. Methods and compositions are described for protecting a metal surface against corrosion. The method involves applying to the metal surface a coating formulation that comprises a radiation curable resin and a corrosion-responsive agent that is capable of releasing a corrosion-inhibiting ion in response to exposure to ionic species characteristic of those present on a metal surface undergoing oxidative corrosion; and exposing the coating formulation to radiation whereby the radiation curable resin forms a corrosion-resisting coating having a low spontaneous release rate of the corrosion-responsive agent into the environment. The present application claims priority to U.S. Provisional Patent Application Serial No. 60/386,058, filed Jun. 4, 2002, and to the U.S. Provisional Application Serial No. 60/466,298, filed Apr. 29, 2003, each of which is incorporated herein by reference in its entirety. Problems with a passivation coating, such as chromium VI (the form of chromium commonly used in aerospace coatings), include the fact that chromium is a carcinogen and federal, state and local agencies have issued regulations that limit or prohibit the use of chromated materials. OSHA regulates the amount of hexavalent chromium to which workers can be exposed, and has proposed reducing the Permissible Exposure Limit (PEL) from the current 50 micrograms/m 3 to less than 1 microgram/m3. OSHA's proposed PEL would severely impact the use of hexavalent chromium throughout the aerospace sector. The need for anti-corrosion coatings, which are pinhole and scratch tolerant, coupled with growing environmental concerns involving heavy metals, such as hexavalent chromium, has led to new coating strategies. In one area, coatings that employ intrinsically conductive polymers (ICPs) have been reported. The first documented observations of corrosion protection of steel by polyaniline were reported in 1981 by Mengoli, et al.,  Appl Polymer Sci., 26:4247 (1981). Since then, numerous papers have been published on the corrosion protection of carbon steel (Kinlen, et al., Corrision, 58:490(2002)), stainless steel (Casparac et al, J. Electrodhem. Soc., 148:B138 (2001)), iron (Beck, Metalloberflacche, 46:177 (1992); and Beck, et al., Electrochimica Acta, 39:229 (1994)), titanium, copper (Brusic, et al., J. Electrochem. Soc., 144:436 (1997), and aluminum alloys (Gelling, et al., Prog. Organic Coatings, 43:149 (2001)), with ICP's. Two comprehensive review articles have been published. See, e.g., McAndrew, Trends in Polymer Science, 5:7 (1997); and Spinks, et al., J. Solid State Electrochemistry, 6:85 (2002). Other work has led to the use of “smart” coatings, which contain materials designed to release a corrosion-inhibiting species on demand during corrosion. For example, in WO 90/10095, Wallace reports a polymer coating, where the polymer is preferably an electrically conductive oligomer, such as polypyrrole, that contains ions such as chromate, EDTA, and others, which are released in response to contact with ionic species that are the product of the oxidative/reductive chemical reactions that occur during corrosion. In U.S. Patent Publication 2002/0197468A1, Sinko identifies corrosion-inhibiting organic pigments, such as 2,5-dimercapto-1,3,4-thiadiazole (DMTD), and others, that demonstrate “throw power” (an ability to maintain a scribed line on a coated metal surface free of corrosion in a corrosive environment). In U.S. Pat. No. 6,139,610, Sinko describes certain inorganic and organic pigment compositions as being effective corrosion inhibitors, again with DMTD being mentioned. In another publication, Sinko identified certain inorganic materials as being potential replacements for chromates. Sinko, J.,  Prog.in Org. Coatings, 42:267-282 (2001). Radiation-curable polymer systems, such as UV-curable resins, can be formulated to be solvent-free, and have been used to form films that contain various chemicals. Kim, Y-B, et al.,  Polymers for Advanced Technologies, 13(7):522-526 (2002), have reported UV cured transparent films containing conductive microgels coated with polyaminiline/dodecylbenzenesulphonic acid (DBSA). Others have reported the corrosion-protective effects for aluminum of polymeric blend coatings containing either polyaniline, polypyrrole, or other polymers, and UV-curable urethane acrylate binders. Vang, C. et al., Polymer Preprints, 43(1), Spring 2002, Papers presented at the ACS meeting held Orlando, Fla., Apr. 7-11, 2002, ACS Div. of Polymer Chemistry. In Japanese unexamined patent JP 11/172103, aniline-type resin compositions are cured with UV radiation. The polyaniline in the cured films is doped with a sulphone compound, and the film is reportedly useful as an antistatic agent. Among the several advantages found to be achieved by the present invention, therefore, may be noted the provision of corrosion-inhibiting methods and compositions that provided effective corrosion protection for metal surfaces; and also the provision of such methods and compositions that supply corrosion-inhibiting agents in response to actual corrosion on a metal surface; and also the provision of such methods and compositions that provide corrosion protection for pinholes and scratches that might occur on the metal surfaces; and also the provision of such methods and compositions that retain their effectiveness through normal weather exposure. FIG. 4 is a normalized difference plot for Pani-DMcT vs. a polyaniline standard, which reveals that Pani-DMcT #1 contains less poly-DMcT relative to its earlier eluting components than in the case of Pani-DMcT #2. When the corrosion-inhibiting ion is an anion, it can be an inorganic anion or an organic anion. Examples of inorganic cations that can act as the corrosion-inhibiting ion of the present invention include an anion that is selected from the group consisting of: CrO 4 2−, CrO12H8 5−, PO4 3−, HPO4 3−, MoO4 2−, BO2 2−, SiO3 2−, NCN2−, HPO3 2−, NO2−, P3O10 5−; and CO3 2−. In preferred embodiments, the inorganic corrosion-inhibiting anion can be selected from the group consisting of: PO4 3−, HPO4 3−, MoO4 2−, BO2 2−, SiO3 2−, NCN2−, and P3O10 5−. x is a number equal to the valence of R 1, provided that x is 1 or higher. The terms “intrinsically conductive polymer”, or “ICP”, as used herein, are intended to include any polymer that, in at least one valence state, has an electrical conductivity greater than about 10 −8 S/cm, and preferably greater than about 10−6 S/cm. ICP's generally have polyconjugated nelectron systems and can be doped with an ionic dopant species to an electrically conductive state. A number of conjugated organic polymers that are suitable for this purpose are known in the art and include, for example, polyacetylene, polyaniline, polycarbazole, polyfuran, polyisothionaphene, polyparaphenylene, polyparaphenylene sulfide, polyparaphenylene vinylene, polyperinaphthalene, polyphthalocyanine, polypyrrole, polyquinoline, and polythiophenepolyheteroarylenevinylene, in which the heteroarylene group is thiophene, furan or pyrrole. Mixtures of such ICPs can also be used. It is known that ICP's, and specifically polyaniline, polythiophene, and polypyrrole, may be made electrically conductive either by electrochemical or chemical polymerization of protonated mononers, or by protonation of the neutral polymer by exposure to protonic acids (often called dopants). For example, polyaniline that is electrically conductive in its doped, or salt, form typically has a conductivity of greater than about 10 −8 S/cm. However, in its neutral, or base form, it is non-conductive and has a conductivity of less than about 10−8 S/cm. R 1 is aryl, alkyl or alkoxy having from 1 to about 30 carbon atoms, cyano, halo, acid functional groups, such as sulfonic acid, carboxylic acid, phosphonic acid, phosphoric acid, phosphinic acid, boric acid, sulfonic acid and the derivative thereof, such as salts, esters, and the like; amino, alkylamino, dialkylamino, arylamino, hydroxy, diarylamino, alkylarylamino, or alkyl, aryl or alkoxy substituted with one or more acid functional groups, such as sulfonic acid, carboxylic acid, phosphonic acid, phosphoric acid, phosphinic acid, boric acid, sulfonic acid and the derivative thereof, such as salts, esters, and the like; dialkylamino, arylamino, diarylamino, alkylarylamino, hydroxy, alkoxy, alkyl, and R2 is the same or different at each occurrence and is an R1 substituent or hydrogen. The term “radiation”, as used herein, refers to the method by which energy is transferred to the radiation curable resin in the coating formulation. Radiation curing can include energy transfer by ultraviolet (UV), visible light, electron beams, X-rays, gamma rays, plasmas, infrared, and microwaves. Further information regarding radiation curing can be found in Fouassier, J-P,  Photoinitiation, Photopolymerization, and Photocuring—Fundamentals and ApplicationsI, Hanser Publishers, New York (1995); and UV/EB Curing Primer: Inks, Coatings and Adhesives, Rechel, C. J. (Ed. ), RadTech International North America (Publ), (1995). Examples of the photoinitiator for a UV curable resin system include First cure (DEAP, First Chemical Co.), Irgacure 651 (DMPA) Irgacure 184 (HCAP), Irgacure 784 (Titanocene derivative), Irgacure 369 (Morpholino ketone, BDMB), and Irgacure 907 (TPMK, from Ciba Geigy), Carocure 1173 (HAP), Darocure 1116 ((HAP derivative), DArocure 2959 (Hydrophilic HAP), and Darocure 953 (C 13-HAP, from Merck), Esacure KIP (oligomeric HAP, from Fratelli Lamberti), Lucirin TPO (trimethyl benzoyl phosphine oxide, from BASF), oligomeric alpha-hyroxyphenylketones, hydroxy-acetophenones, and others described in Fouassier ibid. at 148. When the present coating formulations are applied to metal surfaces by screen printing, the metal can be coated in any screen printing apparatus and then cured in any UV curing machine. An example of a suitable UV curing machine is a Switchback UV curing system, available from M&R Printing Equipment, Inc., Glen Ellyn, Ill. When a film of the present coating formulation having as a radiation curable resin a urethane acrylate oligomer/acrylate monomer blend, such as FD3007C1UV, available from Allied PhotoChemical, Kimball, Mich., is applied to a metal surface, the film can be cured by exposure to radiation from an iron-doped UV lamp, having peak illumination at about 390 nm, with a power setting of 200 watts/inch and a belt speed of 10 feet per minute (fpm) to provide an illumination exposure to the film of the coating formulation of about 1.4 Joules/cm 2. When the coating formulation contains a polymerizable corrosion-responsive agent, such as DMcT, this combination of settings is suitable to cure a film of about 10 microns thickness. When non-polymerizable corrosion-responsive agents are used, thicker coatings, or faster belt speeds can be used. A sample of poly-DMcT, produced as described in Example 1, and two samples of the DMcT-salt of polyaniline (Pani-DMcT), produced separately by the first method described above, were characterized by size-exclusion chromatography (SEC) by methods described by Kinlen et al., in  Macromolecules, 31:1735-1744 (1998). Polymer solutions used in the analysis were prepared in the SEC mobile phase (N-methylpyrrolidone (NMP) saturated with ammonium formate) at a nominal polymer concentration of 5 mg/ml. In the case of poly-DMcT and the two Pani-DMcT samples, only partial solubility was found. The solutions were centrifuged in a laboratory microcentrifuge at 8,000 rpm for 2 minutes. All insolubles sedimented under these conditions and only the soluble fractions were employed in the SEC analysis. The chromatographic flow rate was 0.4 ml/min and an injection volume of 400 microliters was used. Coating formulations comprising a UV-curable resin (available as EXGH-JH-CL from Allied PhotoChemical Co.) containing 0%, 5%, and 10% w/w of either 2,5-dimercapto-1,3,4-thiadiazole, poly(2,5-dimercapto-1,3,4-thiadiazole), or polyaniline doped with (2,5-dimercapto-1,3,4-thiadiazole were applied onto one surface of 3″×6″ aluminum panels selected from 2024 aluminum alloy, 2024 aluminum alloy cleaned by scrubbing with Scotch Brite®, or 7076 aluminum alloy to form the samples shown in Table 1. Each coating formulation was applied by screen printing in a Coleman press through a 305 mesh screen or a 380 mesh screen with an 80 dur. Squeegee. After the application of a film of the coating formulation had been applied to a panel, the coating film was cured by passage of the coated panel through an M&R Switchback UV curing system (Model CWBK-60-208-1-60, available from M&R Equipment Co., Glen Ellyn, Ill.) using a belt speed of 10 fpm and an intensity setting of 200 watts/in. (1.123 watts/cm 2) for an iron-doped lamp, to provide a power input of 1.346 Joules/cm2 to the coated surface for each curing pass. Radiation power and exposure was measured with a High Energy UV Radiometer (available under the tradename UVICURE® Plus from EIT Inc., Sterling, Va.). The cured coatings produced by this method had a final thickness of about 30-35 microns and a density of from about 0.005 to 0.006 lbs/mil/ft 2. Aluminum alloy samples with UV-cured corrosion-responsive coatings. exposing the coating formulation to radiation whereby the radiation curable resin forms a corrosion-resisting coating having a low spontaneous release rate of the corrosion-responsive agent into the environment. 2. The method according to claim 1, wherein the coating formulation is applied to the metal surface as a film and wherein the thickness of the film and the amount of the corrosion-responsive agent in the formulation are selected so that the amount of the corrosion-responsive agent is sufficient to provide a corrosion-protective level of the agent in the cured coating without interfering with the radiation curing of the resin in the film. 3. The method according to claim 1, wherein the corrosion-inhibiting ion is a corrosion-inhibiting cation. 4. The method according to claim 3, wherein the corrosion-inhibiting cation is an inorganic cation. 5. The method according to claim 4, wherein the inorganic corrosion-inhibiting cation is selected from the group consisting of: Ca, Sr, Ti, Mo, Zr, Ce, and Fe. 6. The method according to claim 3, wherein the corrosion-inhibiting cation is an organic cation. 7. The method according to claim 6, wherein the organic corrosion-inhibiting cation is selected from the group consisting of: ammonium, alkyl-ammonium, and cycloalkyl-ammonium. 8. The method according to claim 1, wherein the corrosion-inhibiting ion is a corrosion-inhibiting anion. 9. The method according to claim 8, wherein the corrosion-inhibiting anion is an inorganic anion. 10. The method according to claim 9, wherein the inorganic corrosion-inhibiting anion is selected from the group consisting of: CrO4 2−, CrO12H8 5−, PO4 3−, HPO4 3−, MoO4 2−, BO2 2−, SiO3 2−, NCN2−, HPO3 2−, NO2−, P3O10 5−; and CO3 2−. 11. The method according to claim 10, wherein the inorganic corrosion-inhibiting anion is selected from the group consisting of: PO4 3−, HPO4 3−, MoO4 2−, BO2 2−, SiO3 2−, NCN2−, and P3O10 5−. 12. The method according to claim 8, wherein the corrosion-inhibiting anion is an organic anion. 13. The method according to claim 12, wherein the organic corrosion-inhibiting anion is one that is formed by the ionization of a corrosion-responsive agent that is selected from the group consisting of mercapto-substituted organics, thio-substituted organics, and dimers, trimers, oligomers, and polymers thereof. 14. The method according to claim 12, wherein the corrosion-inhibiting anion is one that is formed by the ionization of a corrosion-responsive agent that is selected from the group consisting of: 1-(4-hydroxyphenyl)-1H-tetrazol-5-thiol, 1,2,4-triazole-3-thiol, 1-pyrollidinecarbodithioic acid, 2,2′-dithiobis(benzothiazole), 2,4-dimercapto-6-amino-5-triazine, 2,4-dithiohydantoin, 2,5-dimercapto-1,3,4-thiodiazole, 2,5-dimethylbenzothiazole, 2-amino-1,3,4-thiadiazole, 2-mercapto-5-methylbenzimidazole, 2-mercapto-5-nitrobenzimidazole, 2-mercaptobenzimidizole, 2-mercaptobenzoxazole, 2-mercaptoethane sulfonic acid, 2-mercaptoimidazole, 2-mercaptothiazoline, 2-thiouracil, 3-amino-5-mercapto-1,2,4-triazole, 5,5-dithio-bis(1,3,4-thiadiazole-2(3H)-thione, 5-amino-1,3,4-thiadiazole, 6-amino-2-mercaptobenzothiazole, 6-ethoxy-2-mercaptobenzothiazole, 6-mercaptopurine, -alky- or N-cycloalkyl-dithiocarbamates, alkyl- and cyclo-alkyl mercaptanes, benzothiazole, dimercapto pyridine, dimethyldithio carbamic acid, dithiocyanuric acid, mercaptobenzothiazole, mercaptobenzoxazole, mercaptoethanesulfonic acid, mercaptoimidazole, mercaptopyridine, mercaptopyrimidine, mercaptoquinoline, mercaptothiazole, mercaptothiazoline, mercaptotriazole, O,O-dialkyl- and O,O-dicycloalkyl-dithiophosphates, O-alkyl- or O-cycloalkyl-dithiocarbonates, o-ethylxanthic acid, quinoxaline-2,3-thiol, thioacetic acid, thiocresol, thiosalicylic acid, trithiocyanuric acid, and dimers, trimers, oligomers, and polymers thereof. 15. The method according to claim 13, wherein the mercapto-substituted organic comprises a mercapto-substituted aryl or heteroaryl. 16. The method according to claim 14, wherein the corrosion-inhibiting anion is one that is formed by the ionization of 2,5-dimercapto-1,3,4-thiadiazole. 17. The method according to claim 12, wherein the organic corrosion-inhibiting agent comprises an organic phosphonic acid, or salt or ester thereof. x is a number equal to the valence of R1, provided that x is 1 or higher. 19. The method according to claim 18, where x is 2 or higher. 20. The method according to claim 17, wherein the organic phosphonic acid is selected from the group consisting of: n-octyldecylaminobismethylenephosphonic acid, dodecyldiphosphonic acid, ethylidenediaminotetramethylenephosphonic acid, hydroxyethylidenediphosphonic acid, 1-hydroxyethylidene1,1-diphosphonic acid, isopropenyldiphosphonic acid, N,N-dipropynoxymethylaminotrimethylphosphonic acid, oxyethylidenediphosphonic acid, 2-carboxyethylphosphonic acid, N,N-bis(ethynoxymethyl)aminomethyltriphosphonic acid, nitriletrimethylenephosphonic acid, aminotrimethylenephosphonic acid, diethylenetriaminepentakis(methylenephosphonic) acid, amino(trimethylenephosphonic acid), nitrilotris(methylenephosphonic acid), ethylenediaminotetra(methylenephosphonic acid), hexamethylenediaminetetra(methylenephosphonic acid), diethylenetriaminepenta(methlenephosphonic acid), glycine, N,N-bis(methylenephosphonic acid), bis(hexamethylenetriaminepenta(methylenephosphonic acid), and 2-ethylhexylphosphonic acid. 21. The method according to claim 17, wherein the organic phosphonic acid is selected from the group consisting of: alkali metal ethane 1-hydroxy diphosphonates (HEDP), alkylene poly(alkylene phosphonate), and amino phosphonate compounds. 22. The method according to claim 21, wherein the organic phosphonic acid is selected from the group consisting of: amino aminotri(methylene phosphonic acid) (ATMP), nitrilo trimethylene phosphonates (NTP), ethylene diamine tetra methylene phosphonates, diethylene triamine penta methylene phosphonates (DTPMP), ethane 1-hydroxy diphosphonate (HEDP), and salts or esters thereof. 23. The method according to claim 1, wherein the corrosion-responsive agent is the salt of an intrinsically conductive polymer and a corrosion-inhibiting anion that is selected from the corrosion-inhibiting anions described in any one of claims 9-22. 24. The method according to claim 23, wherein the intrinsically conductive polymer is selected from the group consisting of polyacetylene, polyaniline, polycarbazole, polyfuran, polyheteroarylenevinylene, in which the heteroarylene group is thiophene, furan or pyrrole, polyisothionaphene, polyparaphenylene, polyparaphenylene sulfide, polyparaphenylene vinylene, polyperinaphthalene, polyphthalocyanine, polypyrrole, polyquinoline, polythiophene, and mixtures thereof. 25. The method according to claim 24, wherein the corrosion-responsive agent comprises 2,5-dimercapto-1,3,4-thiadiazole, and the intrinsically conductive polymer is selected from the group consisting of polyaniline, polypyrrole, and polythiophene. 26. The method according to claim 1, wherein the corrosion-responsive gent is a polymerizable corrosion-responsive agent. 27. The method according to claim 1, wherein the radiation curable resin is a UV-curable resin. 28. The method according to claim 27, wherein the UV-curable resin comprises an oligomer, a photoinitiator, and optionally a monomeric diluent. 29. The method according to claim 28, wherein the oligomer comprises a compound selected from the group consisting of bisphenol A epoxy acrylates, amine modified polyether acrylates, aromatic urethane acrylates, polyester acrylates, and mixtures thereof. 30. The method according to claim 28, wherein the photoinitiator comprises a compound that is selected from the group consisting of oligomeric alpha-hyroxyphenylketones, and hydroxy-acetophenones. 31. 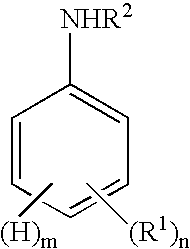 The method according to claim 30, wherein the photoinitiator comprises 2-hydroxy-2-methyl-phenyl-1-[4-(1-methylvinyl)phenyl]propanone. 32. The method according to claim 28, wherein the optional monomeric diluent is present and is selected from the group consisting of dipropylene glycol diacrylate, 1,3 butylene glycol diacrylate, ethoxylated trimethylolpropane triacrylate, propoxylated neopentyl glycol diacrylate, tripropylene glycol diacrylate, trimethylolpropane triacrylate, ditrimethylolpropane triacrylate, and hexane diol diacrylate. 33. The method according to claim 28, wherein the UV-curable resin comprises a urethane acrylate oligomer/acrylate monomer blend. 34. The method according to claim 1, wherein the step of applying the coating formulation comprises screen printing. 35. The method according to claim 1, wherein the corrosion-resisting coating comprises the corrosion-responsive agent in an amount between 1% and 40% by weight. 36. The method according to claim 35, wherein the corrosion-resisting coating comprises the corrosion-responsive agent in an amount between 2% and 25% by weight. 37. The method according to claim 36, wherein the corrosion-resisting coating comprises the corrosion-responsive agent in an amount between 3% and 10% by weight. 38. The method according to claim 1, wherein the exposure of the coating formulation to radiation comprises exposure to a type of radiation selected from the group consisting of UV radiation, electron beam, X-rays, gamma rays, microwaves, laser light, and visible light. 39. An anti-corrosion coating formulation comprising a radiation curable resin and a corrosion-responsive agent that is capable of releasing a corrosion-inhibiting ion in response to exposure to electrochemical conditions characteristic of those present on a metal surface undergoing oxidative corrosion. 40. The formulation according to claim 39, wherein the corrosion-responsive agent is one that is selected from those described in any one of claims 3-26, and the radiation curable resin is one that is selected from those described in any one of claims 27-33. 41. The formulation according to claim 39, wherein the corrosion-responsive agent is 2,5-dimercapto-1,3,4-thiadiazole and the radiation curable resin comprises a urethane acrylate oligomer/acrylate monomer blend. 42. The formulation according to claim 39, wherein at least a portion of the corrosion-responsive agent is a polymerizable corrosion-responsive agent. 43. A corrosion resisting coating for a metal surface, the coating comprising a corrosion-responsive agent dispersed in a radiation cured crosslinked polymer matrix. 44. The coating according to claim 43, wherein at least a portion of the corrosion-responsive agent is present in the form of a homodimer or homopolymer of the corrosion-responsive agent, or as a copolymer with the radiation curable resin, and wherein the portion of the corrosion-responsive agent which is present in the form of a homodimer or homopolymer of the corrosion-responsive agent, or as a copolymer with the radiation curable resin is capable of de-polymerizing in response to exposure to electrochemical conditions characteristic of those present on a metal surface undergoing oxidative corrosion. a radiation-cured polymer matrix that has been formed according to claim 1. (d) recovering the ICP/CRA salt. 47. The method according to claim 46, wherein the polymerization of the monomer of the intrinsically conductive polymer is carried out in the presence of a corrosion-responsive agent and an acid that is not a corrosion-responsive agent, wherein the molar ratio of total acids to corrosion-responsive agent is lower than 8:1. 48. The method according to claim 47, wherein the molar ratio of total acids to corrosion-responsive agent is lower than 2:1. 49. The method according to claim 47, wherein the polymerization is carried out in a medium that is free of an acid other than the corrosion-responsive agent. NL8520247A (en) 1985-05-23 1987-04-01 Inst Mekhaniki Metallopolimern Anti-corrosive material.